If you need my help with Gmarket or otherwise PLEASE EMAIL ME! Please note: Sometimes I need some days to reply as I get really a looooooooot of emails daily. If you have a super urgent question please mention that in your email. Thanks! If you are interested in advdertising on my blog or if you would like to provide me with products to test and review please email me! I am located in Europe. 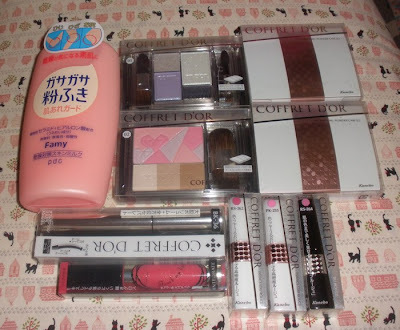 Today I received my most recent Adambeauty haul as he started listing the new spring collection from Coffret d´Or last week! Coffret D´or gave its new collection quite a different look than previous ones, sort of more mature and grown up =( ...with eyehadow/blush refills sold separately from the cases. 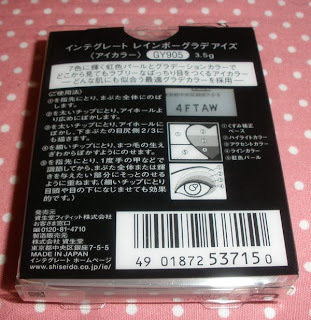 Since the refills and cases are sold individually the total price is higher than for the previous palettes...a bit of a bummer but since the refills come in sturdy clear plastic cases you might actually skip the compact and save some bucks. 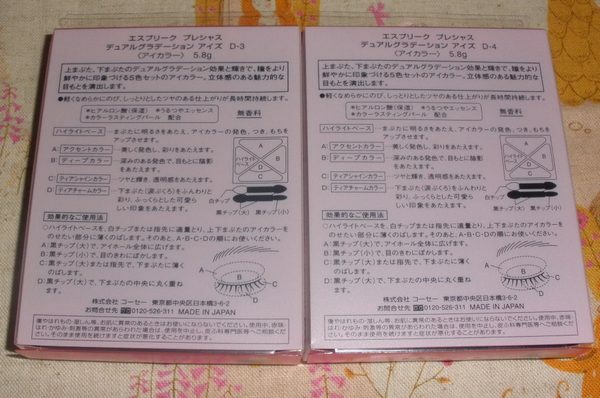 Adambeauty´s prices for the blush or eyeshadows already include a case but you must add the compact(s) of your choice extra (listed @ HK$0), so don´t forget this if you are going to order! Oh and in other news.... going to review this precious treasure here soon, too! I always buy big bottles of shower gel from Japan, my favorites are from Kao Bioré U (Yasuragi Green and the Body Wash Moisture) and from Lion Bathtology (Foamy Body Care ) and my least faves are from Kracie Naive (a bit drying and often a supposedly nice scent like peach turns out perfectly craptastic). I got couple of Bouncia Body Shampoos recently as I liked the promise of "Pure Moist" and "Rich Moist" body soaps. 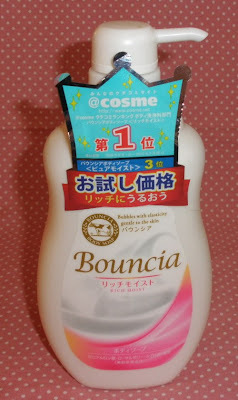 I haven´t started using the Pure Moist Body Shampoo (blue label) yet but I opened the Rich Moist (pink label) recently. The Rich Moist Body Shampoo comes in a generous 600ml pump bottle which means it will last for really long time even with daily use. Refill packs are also available at cheaper rates but they also contain only 450ml. This shower gel is really gentle and doesn´t dry my skin out at all. It creates the softest lather with a dense and rich texture. It´s really a pleasure using this body wash! The scent isn´t the best though. It´s somehow a weird floral-ish scent, not as fresh as I like but neutral enough to like it. Overall a great soap if you have normal-dry skin and want a mild body wash with rich foam. The scent could be improved but isn´t strong or unpleasant. I got mine from eBay, just search for Bouncia. My favorite shower soaps are still the ones from Bioré U! Seems this got a @Cosme award earlier this year! I purchased and reviewed couple of the new Rainbow Grade Eyes fall eyeshadow palettes from Integrate some time ago but recently purchased another color as I really like this range. You can read my reviews on BR701 and VI708 here! 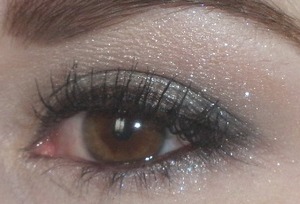 GY905 looked like a perfect black/gray/silver smokey eye palette. 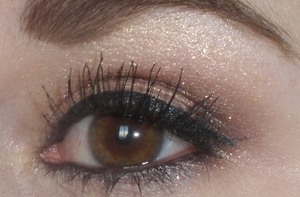 Since the texture of both other palettes was excellent I didn´t imagine that this certain color would be a total dud! For some weird reason this palette doesn´t have the same silky and blendable texture as the other colors but is rather dull, hard to blend, crumbly and applies really blotchy. 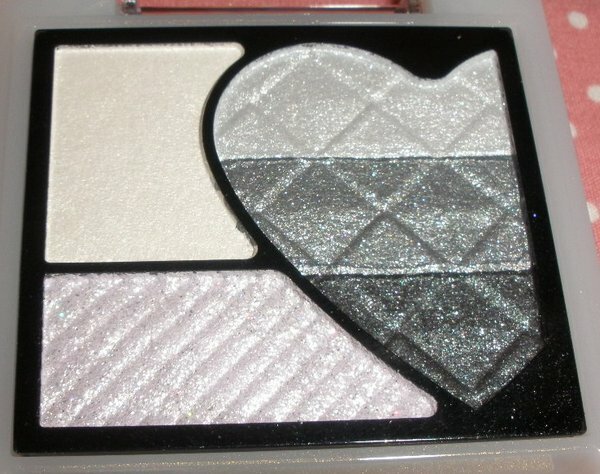 The darkest color is much too light to make a decent smokey eye whereas the cream shade, the rainbow powder and the light silver shade look nearly identical. The medium silver and darkest shade also show nearly no contrast. Really a pity as I expected this to be much nicer. 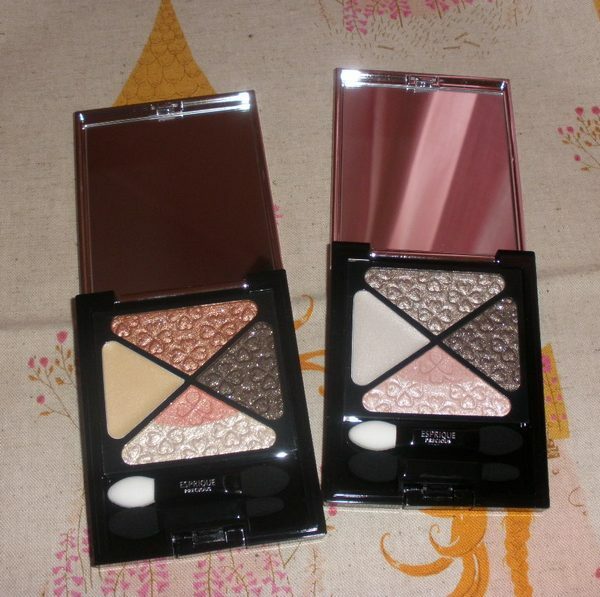 I am pretty shocked how inconsistent the quality is among this range of eyeshadow palettes! 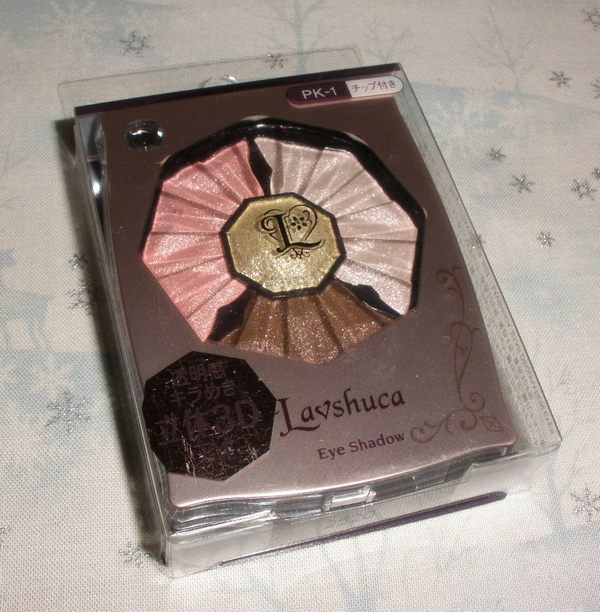 Brands like Kate or Lavshuca offer much better smokey eye palettes for the same price btw! 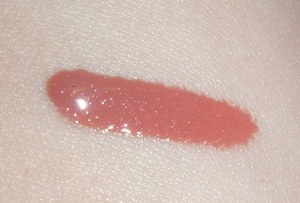 I layered each color about 2-3 times for the swatch below btw... The color pay-off is seriously bad! 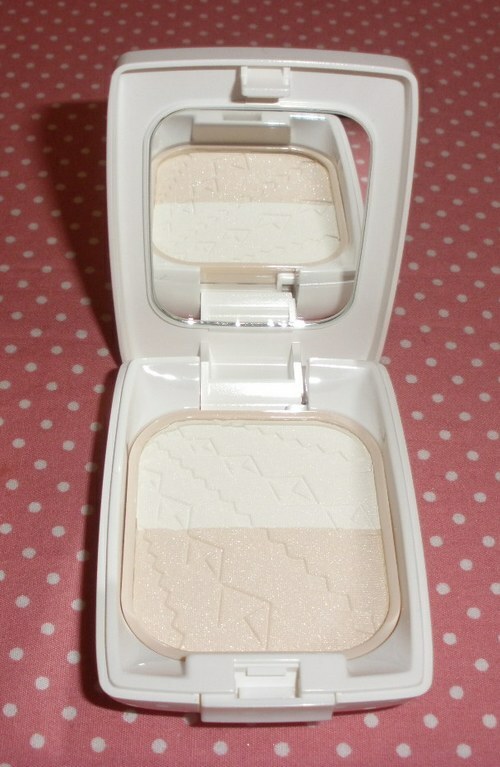 Kosé released a limited edition face powder (or actually a highlighter) called Double Shine Face Powder back in summer or fall (don´t remember exactly). 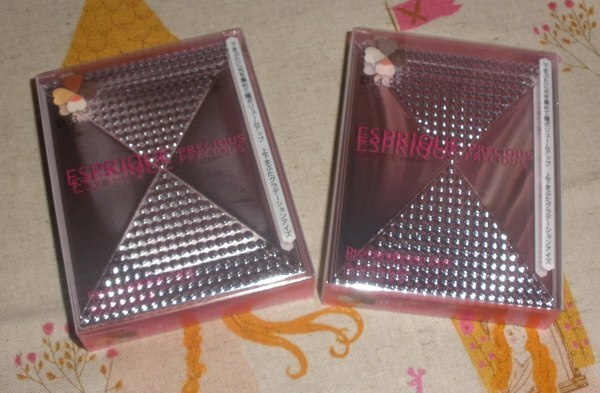 I got mine for cheap on eBay (it came along with a Toning Lotion (Mist) face spray) for less than 20 bucks. Enjoy two types of shine with different tones. Reflect Shine Pearly White with 3 types of silver pearls compounded. Gives skin enhanced brightness and translucency as if reflecting the light. 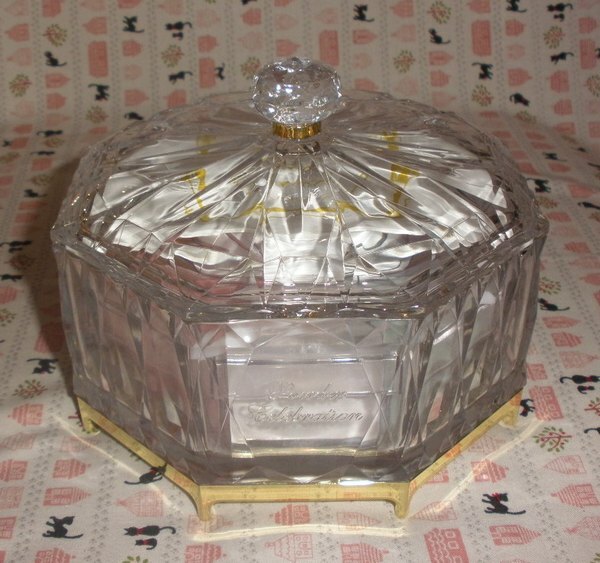 Defines the features of the face with shine and brightness akin to reflected light from a reflecting board. 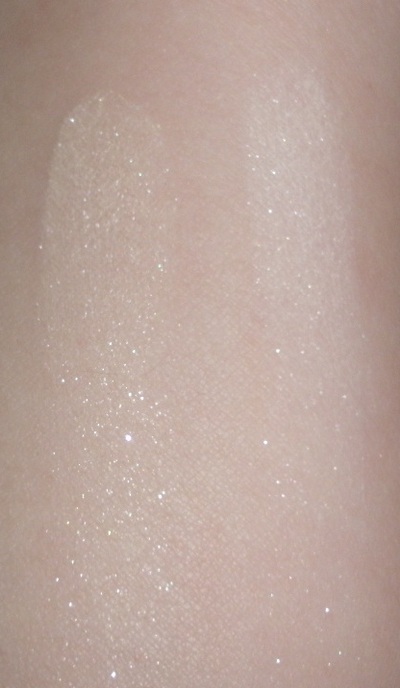 Glow Shine Platinum Beige with large highly-luminant silver pearls compounded. The even shine gives skin the sparkle and brilliance of diamond. A skin tone tinted shade suitable for all skin types. • Offers good coverage appropriate for touch-ups. • Spreads with a fluffy and smooth touch and dresses skin well with an even veil. • Protects skin from UV-rays and damages from sunburns preventing dark spots and freckles. • Comes with a face brush. 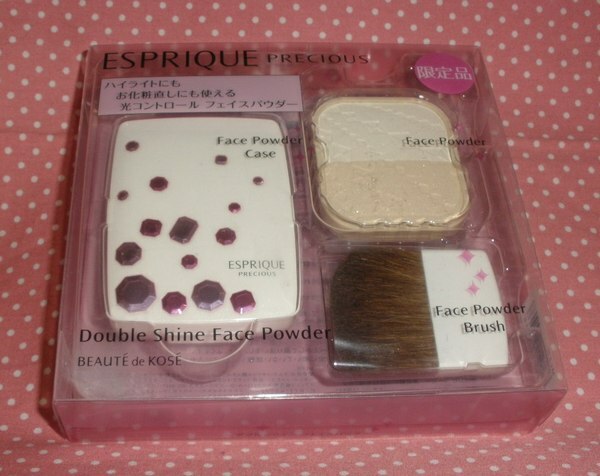 • ESPRIQUE PRECIOUS Foundation can be set in." The case is very pretty albeit it comes along a bit cheap due to the white plastic part which feels a bit lightweight. If I understand the description correctly this is a face powder and I tried it out as such for the sake of this blog but it looks terrible, a total glitter overkill. As a highlighter powder however it´s a lovely product when applied in the right places and with a light hand. There are 2 shades in the compact, a white and a light beige but both blend together for a nice silvery shimmer finish. 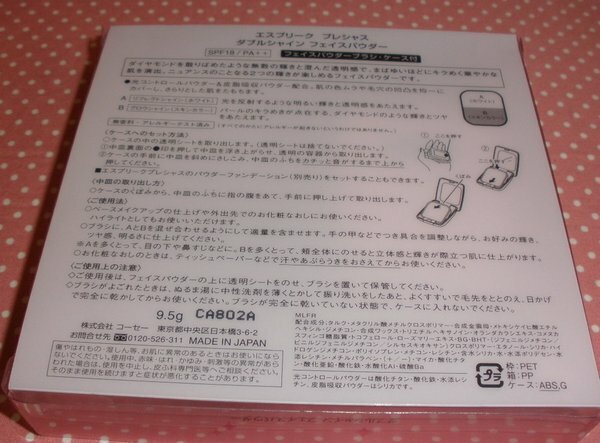 I like this applied on the middle of my forehead, bridge of the nose and on the highest point of my cheeks. You can detect the glitters in bright sunlight but in the current dreary winter weather it looks relatively subtle and pretty. This carries a weird smell though it´s not scented. It´s more like a chalky smell in my opinion so probably results from the ingredients. 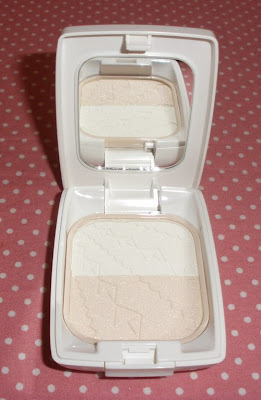 Overall a pretty highlighter but not suitable as a face powder. 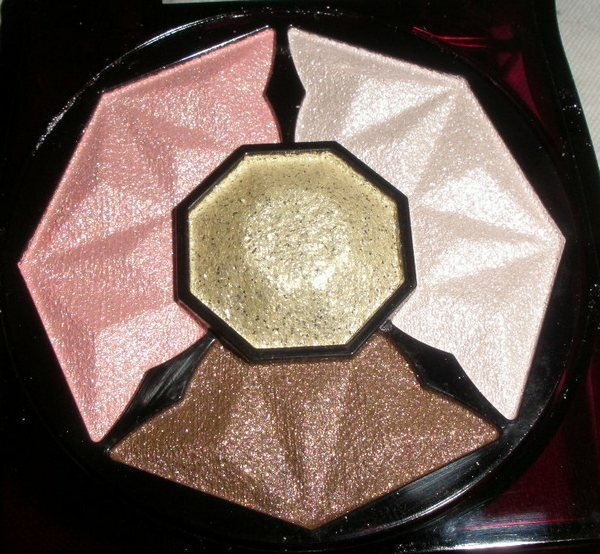 I have other highlighters I like better though as they give a rather dewy than glittery finish so for me the Double Shine Face Powder is rather mediocre. The included brush however is actually excellent, very soft and wide so it helps distribute the product evenly. I have emailed you already! Anyone ready for springtime? I know it´s not even Christmas yet but the first spring 2011 collections from Japanese brands have started popping up in the online shops! 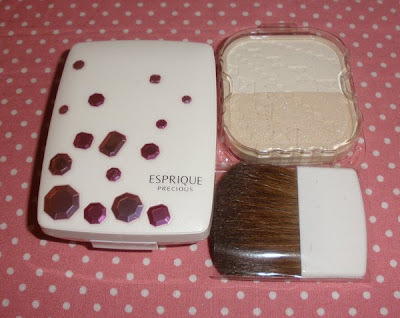 Esprique Precious released an interesting new line of eyeshadow palettes and since eyeshadows are always the most attractive items from a beauty brand I had to pick up couple of pieces to see how they´d perform. The cases of the new eyeshadow palettes look simple yet elegant as they are colored in a shiny pink-tinged silver metallic color. The eyeshadow colors are arranged like a lucky clover and are engraved with clovers all over, too. Each palette contains a cream highlighter base, 2 colors in a medium and deep shade for the upper lids and a color duo of a light and medium shade for the lower lids. The medium shade is always a shade of pink, apricot or peach as it´s supposed to be just dabbed on the middle of the lower lids to make one´s eyes look bigger. 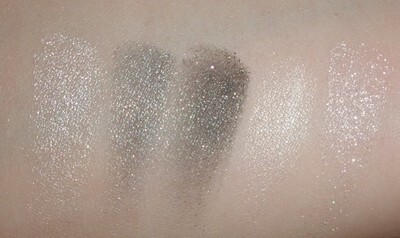 The texture of the eyeshadows is very soft and buttery with great color pay-off (the main colors at least). 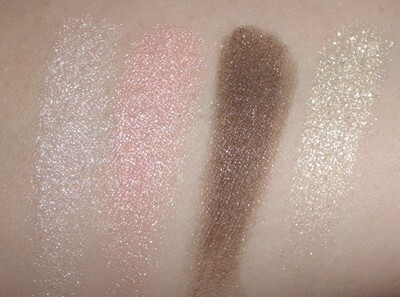 They are actually so smooth to the touch that I first thought all colors are cream shadows but only the base is cream, the others are powder shades. 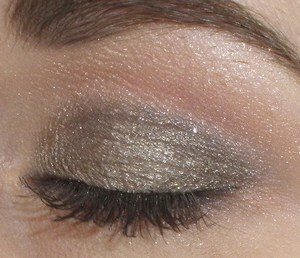 The finish of most colors is metallic, especially the lid colors and the lighter shade for the lower lids. 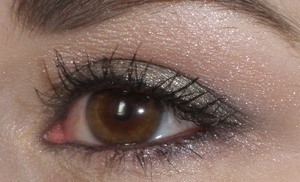 Despite the creamy texture the staying power is great when applying the powder shadows on top of the cream base, I wore D-3 yesterday for about 15 hours and it didn´t crease at all. 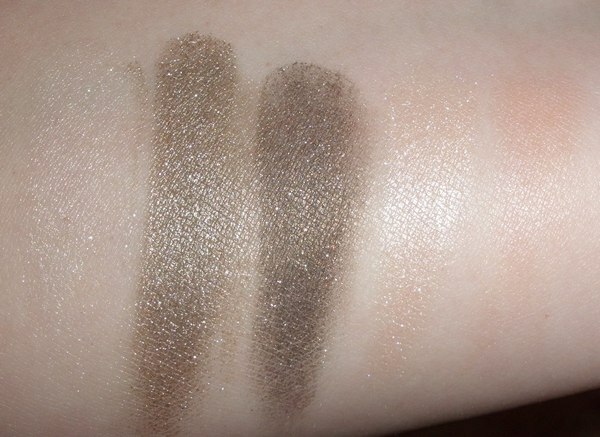 The only little drawback I see is that the shadows need a little more effort to blend compared to some other shadows but therefore they stay pretty color-true without mixing up too badly and getting muddy. D-3 is the color featured in the main look. 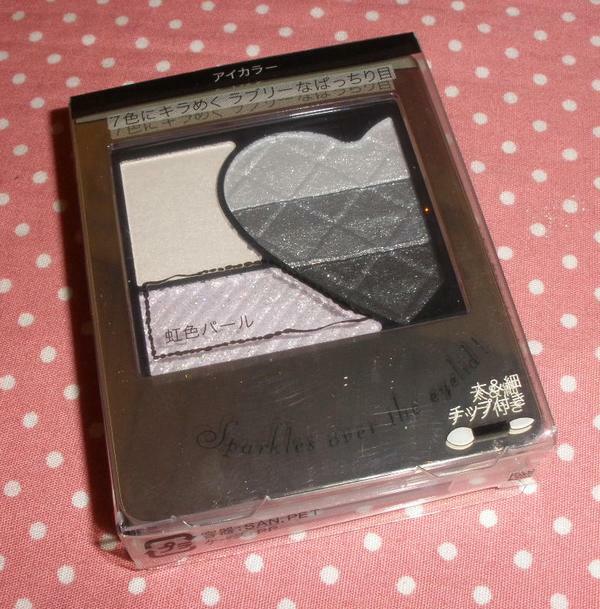 I actually ordered this by mistake and when I first got it I thought of selling it but curiosity won me over and actually I really love the palette. 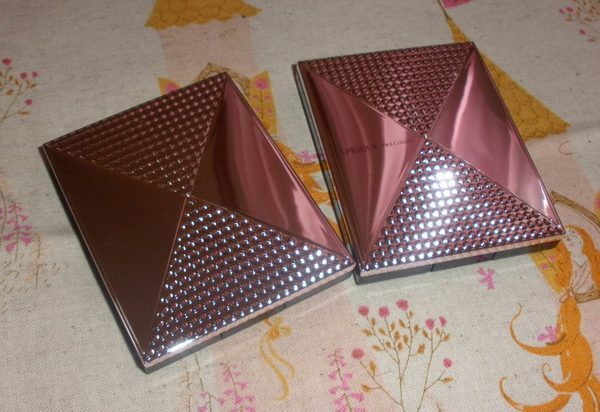 It contains a metallic rusty reddish brown, a deep slightly shimmery red-tinged brown, metallic sheer pale peach and medium shimmery sheer peach for the lower lids and a shimmery pale golden cream base. 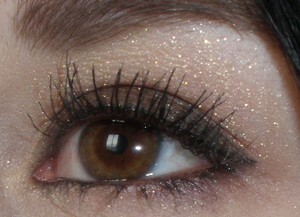 I like that this color combo enhances the slight greenish tinge in my brown eyes. D-4 is a taupe combo so you knew I´d pick that one up, right? 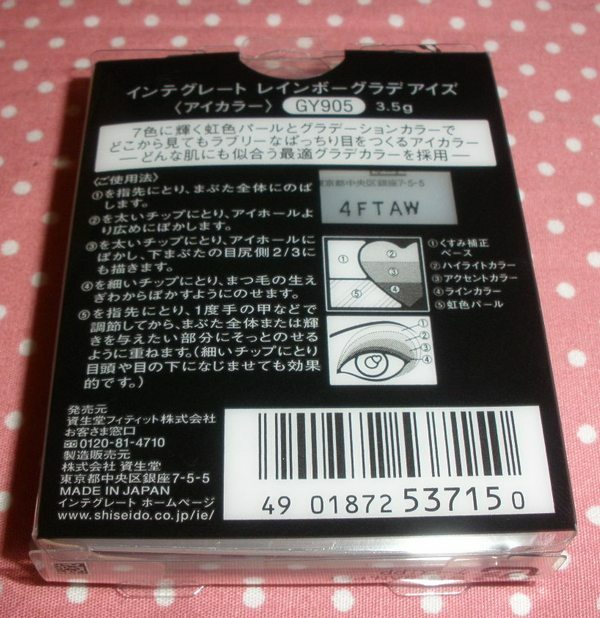 =P It contains a medium metallic taupe gray, deep metallic taupe brown, sheer metallic pale pink and fleshy pink for the lower lids and a white shimmery cream base. 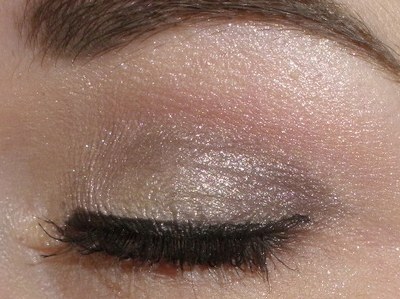 I use the lower lid shades on my upper lids as highlighter on my browbone and below brows, too. Overall these are high-quality palettes very worth checking out. All 4 colors are on the neutral side (the other 2 palettes are pink and olive-themed). I got mine for US$36.95/each from Alphabeautyuk on eBay. Retail price is 3675 Yen in Japan (~US$44). For some weird reason I totally missed the new Liquid Rouge range from Lavshuca that came out for the past fall season. 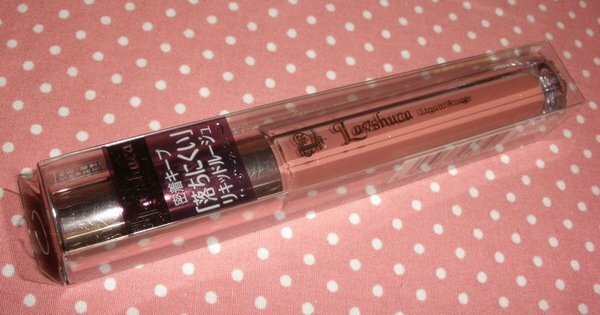 I stumbled across it on Ichibankao a while ago and ordered one of the glosses in RD-2 to try this product out. The Liquid Rouge looks pretty much like the version from Kate, starting from the tube down to the texture of this stuff. Well, Lavshuca and Kate are both Kanebo brands so I am not wondering about that. Packaging is quite simple for Lavshuca standards as usually their lipsticks come in quite elaborate tubes. 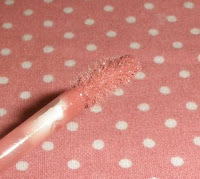 The applicator is a very soft doe-foot type which distributes the right amount of gloss effortlessly. I just LOVE the thick pigmented and highly glossy texture of the Liquid Rouge. If you don´t like sticky or thick glosses this might not be for you but if you want a really pigmented gloss this is perfect. It spreads like a dream and stays put for several hours with the most gorgeous glossy shine. 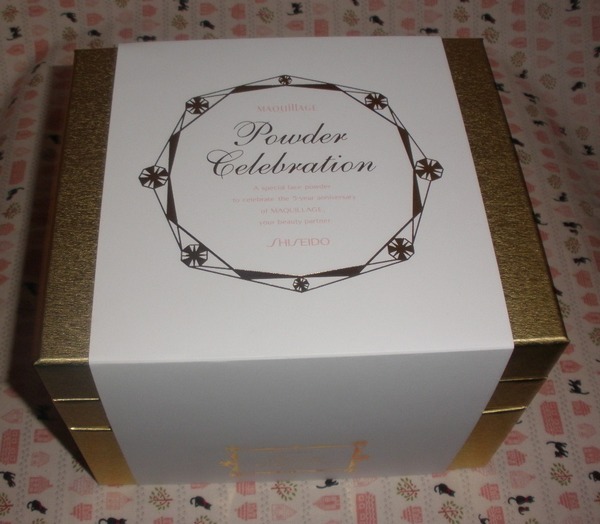 This is unscented and comes in an array of rather neutral colors. To me it was a bit pricey but it was worth every Cent. 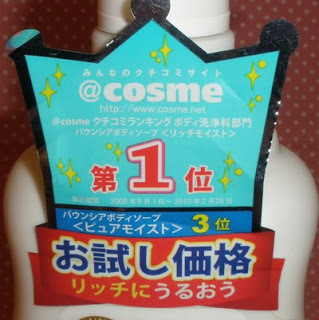 A pity that Adambeauty doesn´t list this product. Sorry for posting so little these days but as I said earlier I have been sick and also a bit uninspired what to write about lately lol. 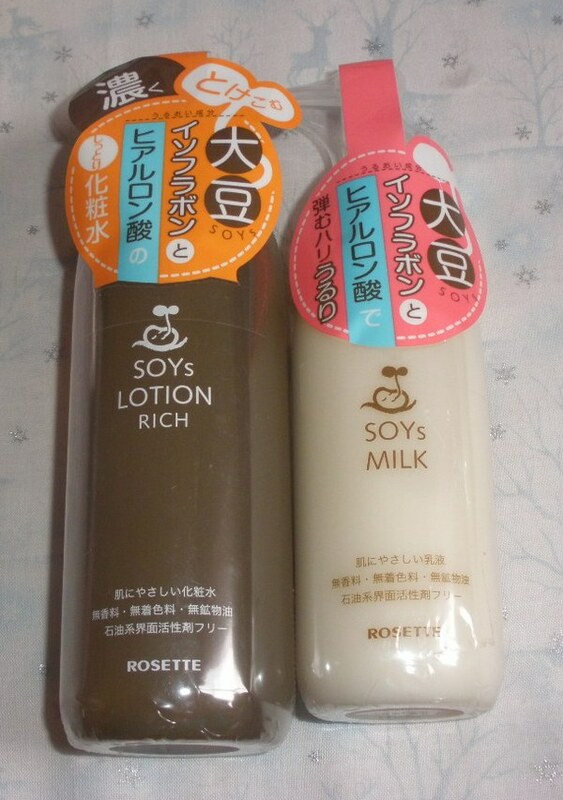 Anyway, I recommended the Soys line from Rosette to so many people already who asked me for skincare suggestions but haven´t actually reviewed the stuff so it was about time to remedy that! Rosette is a Japanese brand, I think the most known range is probably the Hello Kitty line (which includes masks, face washs, moisturizer gel etc.) and Sasa carries quite a lot of products. It was quite coincidential that I picked up the Soys products, I like to add random stuff to my Sasa shopping cart to try out and among them was the Lotion Rich and the Milk from Rosette. 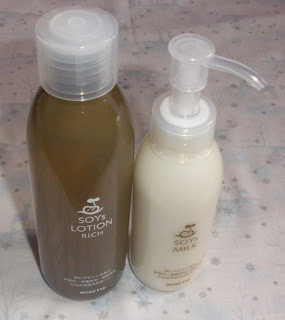 I also purchased the Soys Wash foaming cleanser but haven´t tried it yet so will review this individually one day. As you might remember my skin is really sensitive, for some strange reason much more sensitive to skincare than makeup. I almost never react to foundation, blushes or powders but in like 90% of the times when I try new skincare it turns out to be unsuitable for my skin. The Soys products looked nice and were very affordable (like US$9 per product) so I picked them up expecting they will probably still end up in my "can´t-use-stash" aka trash bin hehe. 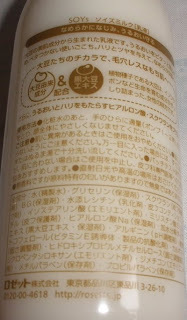 In Japanese beauty lingo a lotion is basically a toner to be used before moisturizer but the whole idea of a toner is different as it´s often more moisturizing (or including other skincare benefits) than clarifying. I have the impression that the "lotion" step is actually the most important in Japanese skincare ranges, often the toners are the most advertised products. 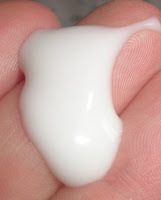 The Lotion Rich is a viscous (as in lightweight liquid gel) clear lotion filled in a brown plastic bottle. 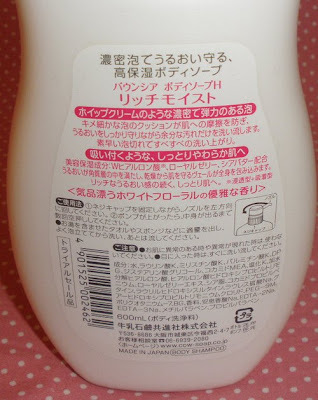 It´s very easy to squeeze or shake this out of the bottle and it´s a refreshing yet very mild and moisturizing lotion. It´s the perfect prep for the Milk which comes in a clear plastic bottle with a pump dispenser. I usually pump 2x in winter and 1x in summer so even though the bottle is small-ish it lasts for about 2-3 months with 2x daily use. Since I use a bit more of the Lotion Rich than the Milk the products finish at about the same time. The Milk is lightweight and not sticky but still it´s rich and moisturizing so for me it is perfectly balanced. It doesn´t leave a greasy film but leaves my skin so super soft and smooth. Since using this skincare (I am on my 4th set of toner and lotion, started using these products about 10 months or so ago) my skin has been in the best state ever, clear and without any red bumps. I really love this skincare range as from the bottle design to the contents this is just perfect stuff in my opinion. I am so obsessed with this skincare that I have several bottles of each of the 2 products in my backup storage (right now 6 bottles/each!)... I am a bit mad I know lol! Both products are not fragranced and super mild. The Lotion Rich contains 200ml whereas the Milk has 120ml. Both products retail for 1050 Yen/each which converts to about US$13 so Sasa is quite a few $$$ cheaper than Japanese drugstores. There is also a regular lighter Lotion available but I chose the "Rich" version for my dry skin-type. I always first cleanse my face (or double-cleanse at night if I am wearing makeup), dab the Lotion Rich on with a cotton pad and then apply the Milk. 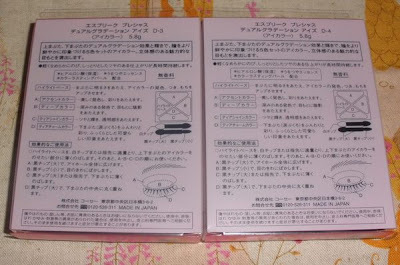 Sometimes I use a special wrinkle treatment afterwards (more for prevention, I don´t have many lines yet), at night I follow with the Kracie Hadabisei overnight mask (reviewed it some time ago). And of course I always dab on some eyecream and lipbalm. 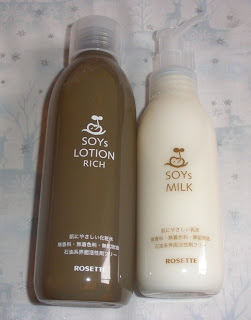 According to Sasa the Milk contains soybeans and black soybean extract, soy isoflavones, hyaluronic acid, soy lecithin and Vitamin E.
The Lotion Rich contains rice fermentation liquid, hyaluronic acid, soybean extracts (white and black) and is meant for dry and delicate skin. According to Sasa both products are unlikely to cause irritations and I have to fully agree in my case. Here are my reviews for BR-2 and here for PU-1 and GN-1. I won´t go into detail regarding texture etc. 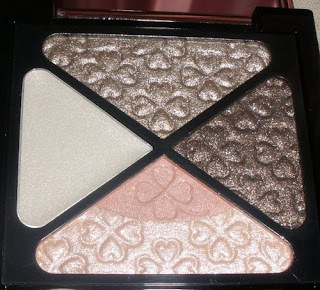 Like the other palettes PK-1 has a super smooth and silky and nicely pigmented texture with great blendabilty, lasting-power and a pearly-metallic finish. 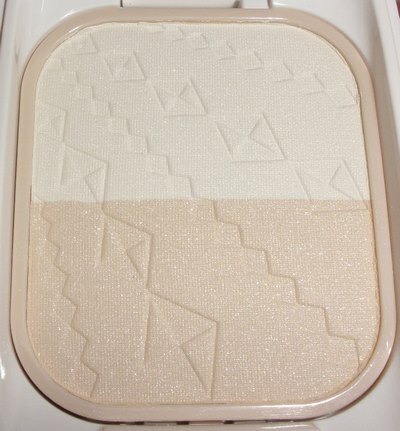 PK-1 is a quad of taupe-brown, white, medium pink and a glittery yellow top-coat shade. 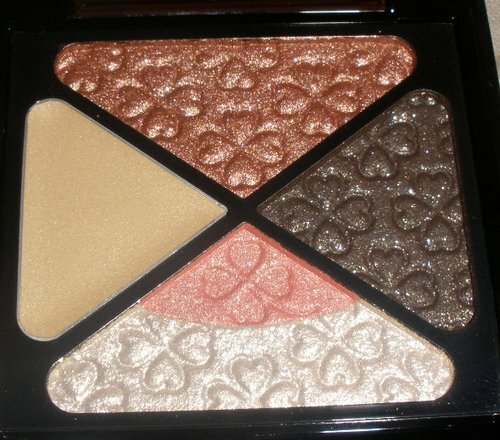 The color combo isn´t unique but the quality is quite outstanding for a drugstore brand so it´s worth purchasing this palette if you are in search of such eyeshadow colors. 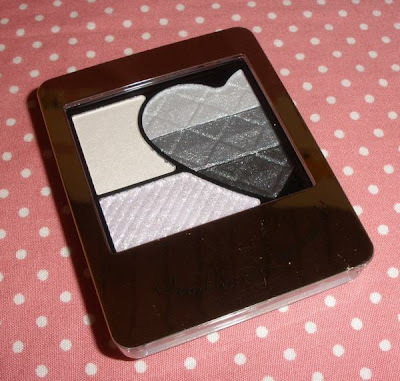 Overall this palette is just like the others from this range, great quality and a good price for such lovely product. 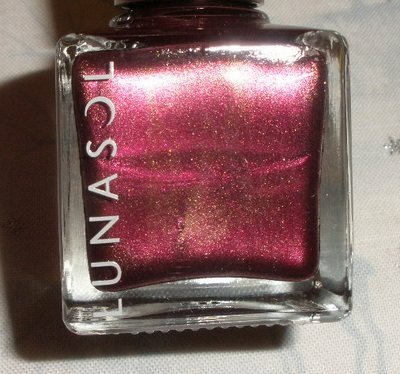 I think this is only my 2nd nail polish from Lunasol, the other one being the glittery one from the Party Coffret 2008. 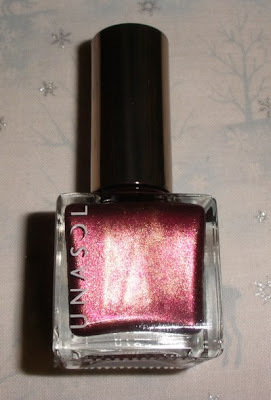 I don´t buy nail colors these days as I have quite all the colors I like and I just have too many anywa... but I couldn´t resist this pretty color from the Xmas collection that seemed to be a color I don´t have yet. Like all products from Lunasol the packaging is simple and sleek, the glass bottle contains 10ml and retails for 1575 Yen (= approx. 19). 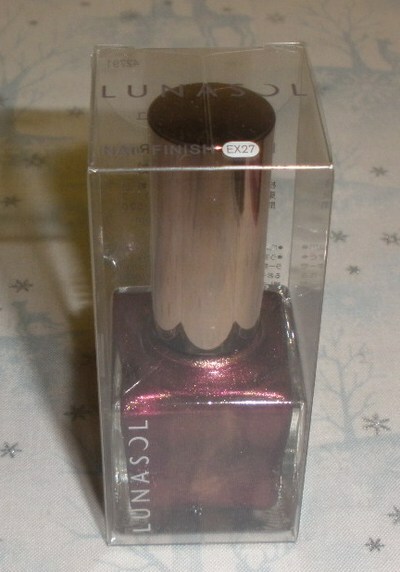 Not cheap for nail polish but still quite ok compared to other high-end brands. The Nail Finish nail polishes have a smooth fast-drying texture with a nicely lustrous and glossy finish. Lasting power is fine, about 3 days before first tip-wear starts to show. 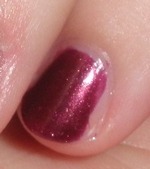 EX27 is a gorgeous deep plummy red with golden iridescence. 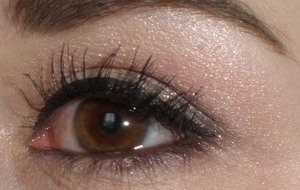 Even though the name says "sheer" it´s definitely not sheer, 2 layers are easily enough to give a fully opaque finish. Overall the result looks like rich red velvet with a golden sheen. Really gorgeous and a very festive color! Wanna read the 274 reviews I wrote on MUA (many for older/discontinued stuff)? Other blogs I love to read! Goat Milk for skin, anyone? Tutorial by JULEP: Winterize Your Nails! What’s in my Friday Favorites? A lot!